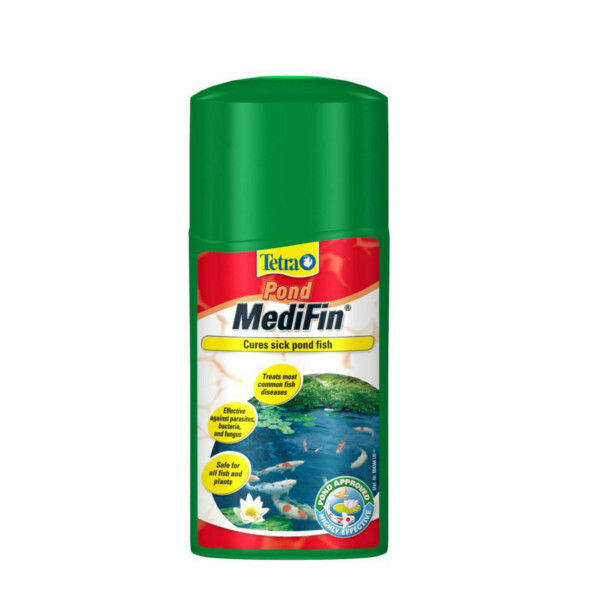 Tetra Pond Medifin is an effective treatment for most common pond fish diseases. Changes in the weather and the temperature in the pond water can cause stress to the pond life inside. This leaves them more susceptible to infections and diseases. As soon as you treat the fish, the better for their health in the long run. Tetra Medifin contains a combination of active ingredients that work effectively to combat diseases like bacteria, parasites and fungi. The treatment also supports wound healing and prevents secondary infections. The Medifin is easy to use and safe for plants and fish. Simply add 50ml of the treatment per 1150 Litres of pond water. Repeat after 7 -10 days if the recovery is not complete. Tetra Medifin can also be used as a preventative remedy and can be added to the water in spring and autumn. 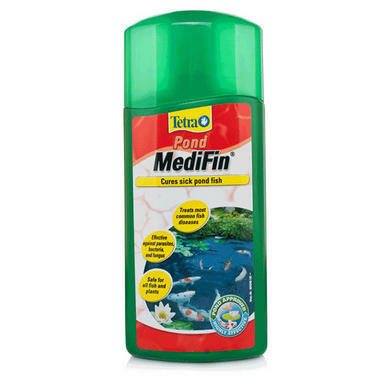 Add 50ml of MediFin to every 1150 litres (250 gallons) of pond water. Disease recovery can be advanced by using Tetra Pond AquaSafe in conjunction with MediFin. Treatment may be repeated after 7 to 10 days, if recovery is not complete, according to the instructions. MediFin can also be used as a preventative remedy, during sensitive times of the year such as the spring and autumn. Do not use MediFin in conjunction with other pond treatments, except those in the Tetra Pond range. Always read the instructions carefully before use.